Corner of Abbott and Saratoga. Photo by Steven Kendrick. Well, it’s finally happened. The condo site at the corner of Abbott and Saratoga has been sold. We knew it could happen – we’ve been documenting what’s been happening to this fabled corner for awhile. And the new owners seem to be serious. They paid $3.8 million for the property – cash. The 2009 assessment for this property was on a total value of $3,284,438. We’re all wondering whether the Coastal Commission approval for the 12 condos still holds. 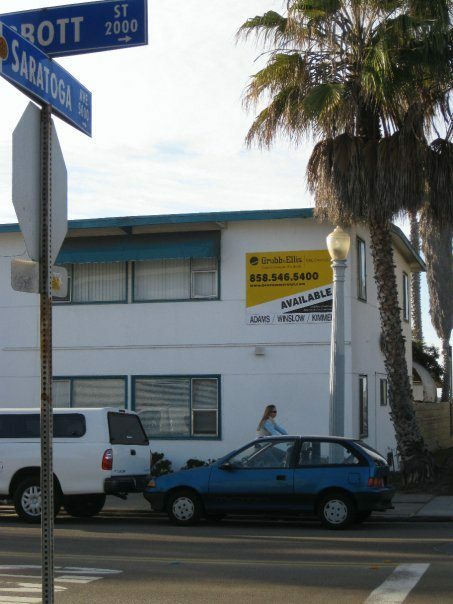 The Ocean Beach corner property a block from Ocean Beach Park at 1984-92 Abbott St. and 5113-19 Saratoga Ave. in San Diego 92107, has been sold for $3.8 million, cash. The buyer was 1984 Abbott LLC, c/o Clark Realty Capital LLC, 3655 Nobel Drive, Suite 500, San Diego. Clark Realty is an Arlington, Va., headquartered real estate company. The new ownership plans on developing 12 new townhomes with an average projected unit floor plan of 1,200 square feet. Currently, the property has 16 rental units. The property seller (assessor’s parcel 448-010-18) was Abbott and Saratoga, LLC, whose members are Tony Struyk, Theresa Struyk, Todd Struyk, Pamela Struyk and Oakcrest Manor SD Inc. Tony Struyk is president of Oakcrest. Tim Winslow, Ray Adams, Jason Kimmel and Kelly Strickland, of Cassidy Turley BRE Commercial represented the buyer and seller. Oakcrest Manor S D is a California Corporation with an address in Mooresville, North Carolina with a guy by the name of Bill Benson out of Yucca Valley as the agent for service of process according to the December 11, 2009 State of California Business Portal. Todd Struyk is the owner of Calpacific Mortgage in University City and a member of the Point Loma Ocean Beach Realty Association as well as Rotary Club 33, San Diego. Todd Struyk is a San Diego real estate agent and loan officer with Calpacific Mortgage. According to the Huffington Post, the Struyk household (including a self employed attorney named Jeff Lake) in Rancho Bernardo gave $5100 to the 2008 Presidential campaign of Mitt Romney. According to I-Newswire (11/24/2009) a predatory lending suit filed on 11/20/09 in San Diego Superior Court alleged that Todd Struyk, Tony Struyk and CalPacific Mortgage Consultants Inc. engaged in loan sharking. The plaintiff, a disabled, retired sheriff’s deputy named Gregg Carling alleges that the Struyk brothers used a predatory lending scheme to defraud him out of his $3.25 million Point Loma home. Welcome to O.B. Please don’t feed our real estate developers. 1,200 sq. ft per unit….I bet whoever buys these units will turn them into vacation rental units. 1,200 sq. ft. X 12 units = 14,400 sq. ft @ $300 sq. ft = $4,320,000. If each unit sells for an average of $800,000 X 12 units = $9,600,000 revenue – $8,120,000 (purchase price $3.8 Mil + construction $4.32 Mil) = profit $1,480,000. Time will tell. when these condos are built, they will seriously destroy a funky corner of the community forever. can’t stop ‘progress’ i guess. and they will give a whole new look to our ‘beach front’ – 12 three-story condos with underground parking – right where it floods. good luck. but the outline of those 3 story condos will substantially alter that whole area of the neighborhood. we may even lose some of saratoga park. Too baD tO LoSe ouR PasT..
and just what will happen to the current residents of this property? Do you really think the new owners will give any consideration to any of these families futures? Perhaps they will offer compensation to relocate them all to comperable rentals? Give the loyal renters an option to buy? Most likely, imo, they’ll simply cast out into the streets, then have the new gentrified residents complain about the ongoing homeless population in town. When will these out-of-touch-with-the-community real estate developers realize that this is not what OB wants? And just what does the Planning Board have to say about a new three story conglomeration that will destroy the view for all those in the surrounding area? Danny… apologies for not making sure you got to see the design of Coronado Palms project. These are public meetings, after all. As to the bylaws, I am not sure that we are looking at the same version of them. We updated ours a few years ago and I don’t see anything about issuing notices other than the agendas themselves. Oh… and for you or anyone else who may be interested, we do have a current vacancy in District 2 than runs through March, with more vacancies possibly on the way. Just throwing that out there. * The OBPB visited a tentative map waiver/vacation of public right-of-ways for these two properties a couple of years ago, and voted to recommend approval 4-3. It was a pretty tough vote, and I have commented on it before. Would be happy to link it or recap my thoughts. * The OBPB was not asked to review the project’s design. As far as I understand it, design review of beachfront properties (and their underground parking) is under the purview of the Coastal Commission. There are other recently built buildings in the immediate vicinity that never came before the OPPB, although they may be the result of permits that predate my time on the Board. * The proposed structure was not 3 stories, per se. It was 2 stories with a sundeck, and it was further setback from the property lines than the existing structures (by about 15 feet on the Saratoga side, I think). There are probably some ocean-facing rental units in the Saratoga apartment building across the street whose view would have been adversely impacted, but as someone who lives at the same intersection, I can say that it was likely a net gain for most people’s ocean views. * I didn’t base my vote on it, but there was a lot that I liked about the proposed design. It was done by a local architect, and while it may not have been a style consistent with that of other parts of OB, it was funky and iconic and not really out of context in that location. I also found that it embraced the surrounding area — quite unlike some of the recently built walled “compounds” and towering monstrosities that are in the immediate vicinity (which again, the OBPB never visited, as far as I know). * I see no reason why the new owner would be beholden to that proposed design. It might save them some time and money as far as permitting goes, but it is quite possible that they propose an entirely new design that would be nowhere near as good as the one being discussed here, and and this new design would never even be put before the OBPB. Perhaps we should all just keep out an eye for that, and hope the new owners appreciate the importance and potential of developing in that location, and what it means for this community. Seth, I was refering in the above to Art.VI Sec.3 (c)(2) of the bylaws passed as City Council Resolution 304448 on Dec. 2, 2008, This in regards to the failure of Board to notify the representatives of the pertinent district which was an issue the Board members themselves brought up. If there are any apologies due they are not due to me but to the others members of the board and to the community. But there is plenty of information that doesn’t see the light of day regarding Board policies and procedures and with that in mind I will take up your challenge to get on the board. Furthermore, several members of the Board took you to task when you denied the Design Element of the OB Precise Plan regarding the Coronado Palms project. This thinking continues in your “private citizen” comments regarding the Saratoga Park thread. I’m begining to see a pattern of exploitation of the commons to enrich the private interest. After all wasn’t it your motion to approve the Coronado Palms? And wasn’t you’re rationale based in the so called “property rights” of the owner? As to my getting “taken to task”, don’t agree there either. In my personal opinion, we don’t all have to agree on everything all the time, and often don’t. I essentially made the point that there was nothing in the Precise Plan that was going to hold up the proposal, and really no legitimate public purpose to recommend a restriction of the applicant’s property rights. Certainly debatable, but the motion did carry by a vote of 7-2. I think my voting record would show, clearly, that I am willing to place the good of the community over individual property rights, but IMO that argument does not always apply. You need a legitimate reason, and a standard that is applied equitably. As to my use of the term “private citizen”, I am just trying to be careful to point out that I am not speaking on behalf of the board or in that capacity in discussions here. I enjoy reading people’s thoughts and want to be accountable to people, but social media is kind of a gray area for the Brown Act and our bylaws and I am just trying to stay within the boundaries. For the same reason, I do not discuss any upcoming agenda items (or likely ones), and why I sometimes get vague or engage in silly lawyerspeak like “as a private citizen”. Danny, I don’t share your interpretation here. All representatives are notified of projects, as we are emailed the same agendas prior to meetings. There was a question about whether the City and the OBPB had issued public notices to neighboring residents on a particular project. The City may not have, and the Board had apparently been advised against this practice at one point. But as you heard, it may engage in this to some extent to make sure people are aware of upcoming projects. I don’t see it, or at least do not interpret it in the same way. As to you or anyone else going for an appointment to that vacant seat (in District 2), I’m not challenging you, just giving you the information. I know you are a committed community member, and think you would do a fine job. If the locals want to keep O.B. the way it is they should start a movement to have locals buy properties here.Millions of people will be coming to San Diego in the next 20 years.They aren’t building any more beach. Buy now while you can. Beach property is uber-affordable, especially these days. If I can come up on $800K-$1M, the bottom end on what likely pricing on these units is going to be (my guess – $1.25M), I’ll have my name on a purchase contract like stink on a pair of week-old underwear, and I’ll live there the rest of my life. But right now I’m sitting here wishing I even had enough scratch for a $285K 700sf 2br/1ba apartment-to-condo conversion that sold a couple weeks ago. Trust me, the urge to own amongst some of us locals is strong. The funds, however, are weak. My fiancee’s mom’s complex up for sale – can I get a head count on who wants to start a NYC-style co-op to buy it with me? Buy a duplex with someone you trust.Look at F.H.A. loans.3 % down. FHA’s requiring 3.5% now in most cases, 5% in some…more attainable than the 20% on a conventional single-family or 30% on a multi-unit property, but not chump change on something in the area. And the bank that had the note on my old place wouldn’t work with me on a DIL or mod when my company got taken over and I got a layoff notice a couple years back, instead foreclosing. I’m one year into a three-year stay on the lending blacklist for the moment, and now that I’m self-employed again it’ll take me these next couple years to build up an income history to qualify full-doc anyway. I’d be more than happy, however, to get you or anyone else an FHA loan – it’ll help me with that whole ‘income’ thing too…click my banner ad to the right to check out the worst website created since Geocities (/shameless self promotion). Dave Rice, I think you have a great idea. If individual ownership is not possible, then interested parties need to pool together resources and co-op. This is a great site to start that conversation.. and make it happen. One more comment….I hope the Saratoga Park Project will be funky, green and filled with good energy. New owners, if you read this blog please consider consulting with some of our local architects, Jim Bell and if possible present a preliminary design to by our planning board (before you finalize your plans) to get community feedback. It’s your money, your project but it sure would be nice to ask “OB” for their thoughts and it might just make it a better project. I think this information is important to us that care about OB’s future. Two sticking points for me where underground parking in a flood zone, and the city giving up property adjacent to park land allowing the developers to intensify the project. Sunshine has a good point, people paying the big bucks for these units might complain about people hanging out in the park, fire rings, marshmallow fights, and there garages flooding. Granted this property could use some upgrading. But is this the type of development we want on our beach front ? There has already been that kind of development at the beach front.Lots of big expensive homes being built in OB the last couple of years.Even the apartments across from dog beach were turned to condo conversions and sold for 500k to 600k.This is where OB is headed.Having T.V. shows shoot here is going to accelerate the process.People are sitting on land that is becoming too valuable not to develop or sell to a developer.You see alot of apartment complex owners fixing up there buildings lately.New paint,new windows,landscaping,new roof.Higher rents?I think that’s what the ultimate goal is for most landowners here.To turn a profit.When the profit is turned the cost of living goes up. Who will the next generation of Obecians be? If you’re talking about the units at Spray and Long Branch, the developer took a huge bath on that, most of the units sat on market well over a year and were heavily discounted…but overall, you’re right – properties are getting cleaned up, and cottages are getting torn down and replaced with vertically-stacked three and four story McMansions. Your other point about the City giving up property raises an issue that was never explained very well, in my opinion. The 20-foot wide public right-of-way that is on two sides of the property (it is now blocked off, but the ocean-facing side is where the residents have their tiki bar and horseshoe court) was originally used as a fire lane. The property line actually runs right down the middle of that right-of-way, and if vacated, half reverts to City property (park space) and half reverts to the owner’s use (which definitely gave him more buildable area to squeeze in a few more units). But to the best of my understanding, the City did not own all of that land, they simply had a right to use it that was based upon an obsolete public purpose. For whatever reason, it didn’t get presented or discussed that way, but for my money, there was no transfer of property involved. There were a bunch of other good points raised for and against, and it was a very tough vote. For myself, I just didn’t think that a property owner should have to buy their own land back from the government when the government doesn’t even have a legitimate public purpose for using it. HA! someone’s been into their medical marijuana prescription! what are they smoking? The reason there’s been little erosion is that the city periodically piles up the sand, especially when they put the winter berm up. We also haven’t had a real storm here in over a decade. Right here in the Rag someone was relating the events of the old lifeguard station’s area ansd the end of Newport when big waves demolished most of it. Seems like someone is forgetting when mother nature wants to do something you ain’t gonna stop her. Do you suppose they took into account that the sea-level is rising due to global warming? Also for your involvement in the community. I know sometimes tough decisions have to be made when it comes to community planning. Like you said in an earlier post it could be worse. ( towering monstrosities ). Thanks, Pat… and likewise. I really could go on for days on that project (speaking only for myself, without any statement on what should or should not happen in the future, of course). Really just brought up a bunch of issues and possibilities. I’m a big believer in everyone being held to the same standards, but let’s face it, that location has to be considered one of the most “important” within OB. Whatever does or does not happen there will help to define this community’s identity moving forward. One could look at projects like that and have legitimate concern over the gentrification and condofication of OB, just as one could see an opportunity to manage inevitable change in a way that helps to preserve the community’s funky spirit. Not sure there is a right or wrong answer there, to be honest. I see more acreage for the community park. Why can’t we envision something that will be a value added development for the community as a whole? Why not focus on something bigger than ouselves? Just dreamin…. A proposal for the Colburn Cottages at the head of the pier will be coming up for review on 7/21 6:30 Project Review Committee of the OB Planning Board in the Rec. Center…CRY FOR O.B.! I’ve been out of the loop for a while. Can you tell me more about the proposal for the Seaside Cottages? I was just on the Planning Boards website. I was somewhat relieved by what I saw regarding the cottages by the pier. You can bet I’m going to try to be at the meeting.